بني في , Kakadu Lodge Cooinda Managed by Accor- Ibis Style هو ميزة مُضافة لـ كاكاداو و خيار ذكي للمسافرين. يقع الفندق على بعد 300km من مركز المدينة، ويؤمن الوصول إلى أهم مراكز المدينة. يوفر الفندق بفضل موقعة الجيد وصولاً سهلاً إلى أهم معالم المدينة.
. إن الخدمات الممتازة وحسن الضيافة العالي في Kakadu Lodge Cooinda Managed by Accor- Ibis Style تجعل إقامتك تجربة لا تنسى. يمكن للنزلاء الاستمتاع بالميزات التالية: متجر, خدمة التنظيف يوميًا, متجر هدايا/تذكارات, خدمات بريدية, مجهز لذوي الإحتياجات الخاصة أثناء إقامتهم في هذا المكان الرائع. لقد جهزت هذه الإقامة الفندقية بعناية فائقة لتوفر مستوى عالي من الراحة. في بعض الغرف يجد النزيل تلفزيون بشاشة مسطحة, غرف لغير المدخنين, مكيف هواء, تدفئة, خدمة الإيقاظ. كما أن مجموعة الخدمات الواسعة الموجودة في الفندق لضمان راحتك تترك لك الكثير من الخيارات لقضاء وقتك أثناء فترة إقامتك. إن كنت تتطلع إلى إقامة مريحة وهادئة في كاكاداو، فستجد في Kakadu Lodge Cooinda Managed by Accor- Ibis Style بيتك الثاني. Staff were extremely helpful & very friendly in all areas of resort. Room was lovely and clean & beds very comfy. Yellow water cruise was excellent, Dennis & Kevin really know there stuff and couldn't be more helpful. Great memories from trip. Very nice hotel, all the facilities are modern and very clean, superb location for the yellow river tour. There are mosquito outside which is expected for living next to the river but there also many cane toads on the property to keep the insect number down. Circle of life just outside your room door. 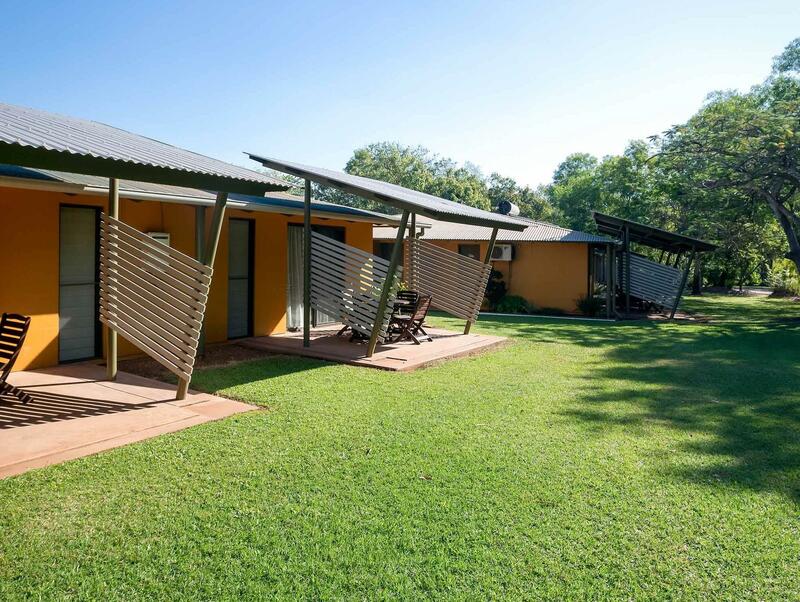 Considering the overall option for Kakadu accommodation (nothing bling)- we were pleasantly surprised with this lodge. We booked it as it had the overall best reviews for the park and I can see why. It was clean, cool (air con worked well), friendly staff, great access to the boat tour (3 min walk) and the food at the bistro was fantastic. We booked the superior room. It was spacious, very clean (I am OCD), very comfortable mattress and pillows. Things inside the room included bar fridge, coffee and tea maker, ironing table and iron. Had a fan and an aircond. Bathroom was very brightly lit. Love the shower gel and the shower door. So posh! Toilet lid was self closing (slowly) so good! The guy at the Barra bistro (I didn't get his name) also had a great customer service, such amazing people skills! He was there that night we had dinner and was there the morning after we came back from the Sunrise Yellow River Cruise greeted us with big smile! ** The following things are really NOT important and didn't bother us one bit but I thought I should put this for some people. Shower room itself may be a little small for the bigger people. Also you are still in a National Park, so bear in mind tiny ants that want some drinks out of your cups on the bench or sink in the bathroom or taste of your toothpaste! Great place to stay and do the sunset/sunrise+breakfast cruises at a much reduced price. We stayed in a family room (4 adults) and saved more money. Much more bird activity on the sunrise cruise but both were excellent value. Highly recommended. If you want wifi then this place is not for you. We loved staying at Cooinda. Our double room was newly renovated and had a lovely comfortable bed. The restaurant had lots of options and we found it the staff very friendly. The pool was huge. Beautiful lodge. Great crowd and yummy food. Love the place!! Loved the location, loved the sunset yellow river tour with Ruben, who was so genuine. This is truly a special place, where one can learn so much about nature and it’s people. We had an exception stay at Cooinda once again. 2 nights is never enough but during our stay we were looked after well in all regards. The morning Yellow Waters tour is amazing and so too the other locations we visited. We will be back I am sure. Our guests all raved about how good it was. Had a weekend at Cooinda as a base to show visiting family some of Kakadu. We found it very clean and well maintained. The staff were very good. The bar and restaurant were also reasonably priced and had decent menu to choose from. We were pleasantly surprised by the freshly renovated room and the onsite facilities this place has to offer: decent restaurant, a small convenient store, petrol station, bus stop to the nearby Yellow Water cruise. Prices are a tad expensive for what it is but considering the remote location it was acceptable. The only pros for choosing this place is it's proximity to Yellow Water Cruises. Otherwise the room is really too small to fit 4 adults. We paid $50 for an extra bed but got a bed that was not stable as the locking screws are broken. There is also no space in the room to fully setup this bed. Toilet facilities was old, doors could not lock properly. We were informed that we could use microwave oven in the camp kitchen. We were appalled by the dirty condition of the camp kitchen, the oven & all. It was so yucky. The highlight was the yellow river cruise which we booked through Cooinda, whihc we did at sunset. It was stunningly beautiful and we pulsar believe how much wildlife we saw and how fabulous the staff were. The hotel is 5 minutes away from the boat ramp. We came back after dusk and had a good meal and a swim in one of the two pools. From the moment we drove in we were awestruck with the greenery and earthy colour's of the facilities. The staff were extremely helpful and cheerful. The tour guides are an amazing bunch of people especially Reuben . Thanks to Johnno, Matt, Tom , Jaz and Reuben for making my 50th very special. Lovely big s/c room ..comfy beds, fridge..Layout of bungalows well done close to parking and all facilities. Food in restaurant was excellent and not over pricey . The Yellow water river cruise is not to be missed!! We did both sunset and sunrise. 2nd trip offered at v cheap rate. Had a wonderful and relaxed stay. Even though the lodge houses many people it is still quiet and really good with children (several pools and a playground). Only downside is when tourbuses arrive for lunch buffet. Correcting my booking after I had double booked after my daughter's flight bookings (for six people) took a long time, but I did receive a refund for all but one night in one room. I was grateful for the refund, but a few hundred dollars were wasted on the unused room. There seemed to be a continual problem with the printers in Reception which meant that no tickets were printed for the Yellow Waters Cruises on the two occasions on which I booked. Despite the assurance of the Reception staff that this would not matter, I was subjected to an intense interrogation by the first tourist guide who felt that I might have been "tricking" her company although my name was on her list with a booking for eight people, all of whom were with me. I found this degrading, but we were allowed on as fortunately I had the small printed receipt from the EFTPOS machine on me. She proved to be a good tourist guide if a deeply suspicious one! The first time the printers were not "working" and the second time, they had run out of ink. However, the second tourist guide let us on without demur once I showed my little receipt. Otherwise, the staff were very helpful, efficient and considerate, particularly those serving meals under a great deal of pressure.